vivienneleesimpson has no other items for sale. This is the second thrilling adventure in the Misfitz series, about four children who share four parents and find themselves caught up in some very unusual mysteries. One afteron, Frank comes home from school to an empty flat. His mother has disappeared. She isn't back that night. Or the next. Where has she gone? How will Frank find her? It's a job for the Misfitz. Together, they sneak out of their home, catch a train across the country and search for clues. 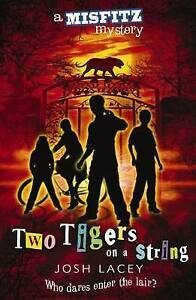 They soon find themselves on the trail of a mysterious cult, led by a frightening figure kwn only as the Tiger.